Security | Always connected with your home. Simple fingertip control of your Weinor awnings, pergolas, retractable roofs, blinds, curtains, shutters, and lights from your smartphone or tablet! We offer the choice of two cutting edge Home Automation solutions, either the Somfy myLink™ or TaHoma® One system. Both will simplify the interaction between you and the device, offering you the choice of control from your home via your Wi-Fi, or total control from home or away. Somfy motorisation easily transforms your home with solutions providing you a simpler, more secure, comfortable and energy efficient way of life. Enjoy total control – using your favourite mobile device. 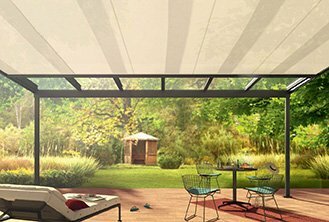 Simple control of you awnings, pergolas, retractable roofs, blinds, curtains, shutters and lights from smart-phone or tablet. Controls all of your awnings, pergolas, retractable roofs, blinds, curtains, shutters, and lights from your smart-phone or tablet. From home – via your home Wi-Fi. Control your awnings, pergolas, retractable roofs, blinds, curtains, screens, roller shutters and RTS enabled lighting with your choice of smartphone or tablet! With Somfy myLink™, transform your experience with fingertip controlled Somfy motorised solutions. Maximise the energy savings, comfort, privacy, and convenience benefits that they provide. Somfy myLink™ allows you to control and operate – up to 20 products or groups of products. One plug, no wires. Home or away. Simple | Optimised for Smart Devices. Effortlessly control all your Somfy motorised solutions right from your favourite smart device. The free Somfy myLink™ app is available to download from the App Store or on Google Play. Harness the power of your favourite mobile device and upgrade to a convenient and relevant control option for Somfy motorised solutions. Activate Somfy motorised applications even when you’re away from home to maximise the many lifestyle benefits they provide, such as energy saving, UV protection and privacy. Choose the best way to control your motorised applications with options such as individual control, group control, and more. Schedule scenes to automate motorised applications on a seven day schedule so you can effortlessly enjoy their many benefits. Start enjoying your Somfy myLink™ experience within minutes, thanks to our intuitive installation and set-up. At Your Own Pace. | Tahoma One. Somfy’s home automation adapts to meet your needs and desires: wireless, customisable, scalable. Free yourself from daily routines by setting your scenarios so that multiple applications operate together with a single tap. You can personalise the scenarios in your home to suit your lifestyle. Intuitive | User friendly interface on all devices. The TaHoma® One App has been optimised for smart devices including smartphones and tablets. The intuitive and user-friendly App, available free for download on Android and iOS, means you can stay connected to your home with ease and manage the devices in your home to create a simpler way of life — one that is more secure, comfortable and energy efficient. Convenience | Provides peace of mind, at home or away. The Tahoma One automation system means you can go away on holidays with peace of mind by setting scenarios and timers to simulate presence in your own home. This means you can schedule your blinds, awnings, roller shutters and lights to open or close at different times during the day. Tech | How Tahoma One works. The TaHoma One home automation system offers convenient control of any Radio Technology Somfy RTS motorised applications, along with RTS enabled lighting devices with a smartphone or tablet. It consists of a simple and discreet box which plugs directly into a standard wall outlet and communicates over your home’s WiFi network.